Sony may not have a flagship Xperia Z4 to show off at Mobile World Congress next month, but it will have other new handsets, such as the mid-range Xperia E4. The new device, which has a 5-inch display and promises up to two days of battery life, goes on sale later this month. 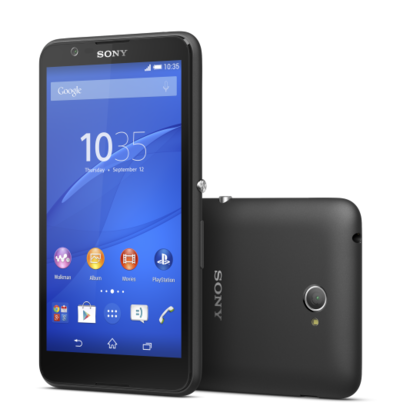 The Xperia E4, which leaked out early on Monday, is Sony's answer to popular affordable smartphones like the Moto G, and it offers similar specifications. In addition to its 5-inch qHD display, it packs a 1.3GHz quad-core processor, 1GB of RAM, and 8GB of internal storage. There's also a 5-megapixel camera on its back and a microSD card slot under its hood, and it will be available in a dual-SIM option. It's 3G only, however, so there is no super-fast 4G connectivity. The Xperia E4 will ship in black or white, but just like with the Moto G, users will be able to purchase interchangeable covers for it to add a splash of color and change up its look. Sony is launching a new app alongside the device called PartyShare, which lets users share music and pictures via Wi-Fi direct. The app will also be available on other Sony smartphones running KitKat and above from today. One of the Xperia E4's biggest selling points is its battery life. It's packing a 2,300mAh battery, which Sony says will provide up to two days of use in between charges. That's pretty impressive for a smartphone these days, but we'll have to see whether the Xperia E4 lives up to those claims. You'll be able to get your hands on it from mid-February, but Sony hasn't yet confirmed how much it'll cost.